LeKitten wrote: I was playing Starry Sky ~in Spring Yoh's route (I couldn't make myself play anyone but Kanata till now) then I got into a blood thirsty mood so now I'm in Mass Effect 3. Even though it isn't an otome game.. im playing Rewrite as well. Just finished a route, it's a lovely game with great voice acting and beautiful art. I'm currently playing Amnesia and Starry Sky in Summer. 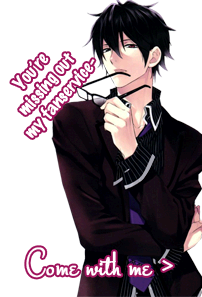 I recently beat Kent's route on Amnesia (and boy did I love it) and Ryunosuke's route on Starry Sky. I seriously just can't play just one of these games, I keep switching back and forth haha. I'm about to start on Toma's route next in Amnesia though. Oh boy. I'm playing Riddle Garden at the moment. I guess it's just alright. Just finished with Eikoku Tantei Mysteria so I'm currently multi-tasking between Hana Awase and Arcana Famiglia. Eryx wrote: Just finished with Eikoku Tantei Mysteria so I'm currently multi-tasking between Hana Awase and Arcana Famiglia. I just started playing Garnet Cradle. All the guys are leaving a pretty big impact on me after the first meeting. It seems that I am destined to either love them or hate them. I'll give them all a fair chance though. I don't know what is going on yet, but that blonde guy Rihito is making me paranoid. He looks like he'll try to kill me in my sleep. So far he's been nothing but nice, and slightly pushy, but I don't trust him. He will have to prove himself a decent man. When I heard Hirakawa Daisuke I realized Ace had ruined me XD. I've been playing Frozen Essence and OMG THE FEELS, THE CHEESY GOODNESS NOEIVHOUBJAHKHVKDHKBVHKADNVNDFHAKN "'( ,☒☖☒ )'/"
Dandelion: Wishes Brought To You. I've streamed Jisoo's path on my channel, and am currently streamig Jihae's, although I've shelved that for later because I'm going back to streaming actual shows on my channel for a bit. Just finished Riddle Garden, and now I'm onto Corpse Party portable. I just love the title. Corpse Party sure sounds like a party I'd wanna gatecrash, not. Currently, Otome games: None. Other games: Rewrite Visual Novel. Focusing on Dandelion Wishes, DmmD, 7th Dragon 2020-ii, Fate Extra CCC right now. Right now, I'm playing Re: Alistair++, then I plan to finish Rewrite, Shikkoku no Sharnoth, and True Remembrance. Whoopsie, so many good visual novels that you guys are playing now! They are goodies. Especially Shikkoku no Sharnoth, I don't like the mini games though.